You only need to scroll through the photos of iconic buildings bathed in purple in the days following Price's death to see evidence of his presence. From the Eiffel Tower to the Superdome, the world glowed his signature color. As we ponder his death amid the outpouring of tributes, I offer this thought: your presence is what remains in your absence. Not only when you leave the planet, but just as importantly, every time you leave the room. Nearly every leader underestimates the impact their presence has on their ability to lead. They think presence is an undefined "X" factor and they leave it to the rumor mill to decide how others define them. Crucial mistake. Your presence precedes you into the room, follows you everywhere, and directly influences others' decision making and whether your leadership will succeed or fail. Do you have an influential presence? Or are you undermining your leadership by leaving it to chance? 1) You have a curious mind that zeroes in on solutions. Friends say Prince took copious notes about cultural and economic issues and hosted the equivalent of academic after-parties. He dissected problems and focused on solutions and action. Need an example? While he was privately helping the family of Trayvon Martin, a black teen who was famously shot and killed in Florida, Prince thought deeply about the implication of the hoodie that Trayvon wore. According to his close friend and activist Van Jones, Prince concluded that white kids in hoodies were considered the future Mark Zuckerberg's of the world, while black kids donning hoodies were thought to be thugs. So he helped Jones launch the #YesWeCode organization to develop black leaders in the tech industry. His wildly curious mind led him to take positive action. Where does your mind lead you? 2) You don't play the game - you change the game. Prince was constantly evolving. An early innovator in technology, he invented algorithms for music and used crowd funding before it was even an official thing. His prescience and ability to move quickly made him a prolific artist with a catalogue of 40 studio albums plus thousands of songs in his famous Paisley Park Vault. What's in your vault that would stand the test of time that people would value? Prince constantly conquered and reached for the next level of excellence, leaving a path for others to follow. Artists from Justin Timberlake to Bruce Springsteen and Elton John are now sharing the impact that Prince had on their own musical evolution. What's in your vault that would change the game? 3) You usher others to greatness. 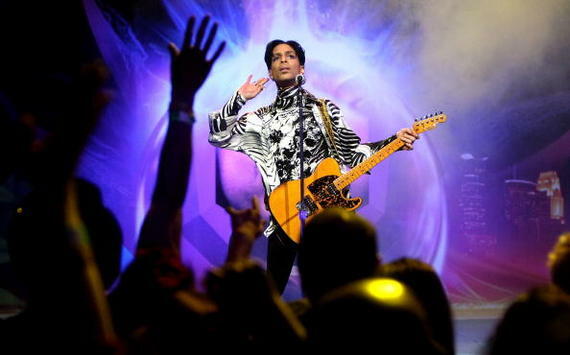 Since his death, we're now hearing how Prince was a generous cheerleader for budding artists. How was he able to motivate so many? Artists whom he privately mentored said his genius didn't get in the way. Instead, like a great coach, he brought others' best talents to the surface by allowing them to be who they were at their core. "When you were in his company," one mentee said, "you believed you could do anything." Perhaps he was determined to help identify and tap into others' greatness because his dad had been so hard on him growing up. In an interview, Prince said his dad constantly criticized him and he never felt good enough around him. Prince also used his generous spirit to help others through tough times. We're learning that he was a quiet philanthropist, who wrote big checks without revealing that he was the source. How do you usher others to greatness? 4) You know what you stand for - and stand against. Prince was deliberate. Intentional. And lived with purpose. His conscience was social and he knew what he stood for - and what he stood against. His battle with Warner Brothers for the rights to his name and music catalogue was epic. Though diminutive in stature, his belief in artists' rights, stood a hundred feet tall because it was an issue that he considered much bigger than himself. He was quoted as telling other artists, "If you don't own your masters, your masters own you." Prince was adamant that artists should own their own identities. That's why he changed his name to a symbol for years, until the clock ran out on the contract he deemed unconscionable. In the complicated and often mysterious music industry, he stood his ground until he could take his name back. Do others know what do you stand for? And what you stand against? 5) You fuse your professional and private lives. Prince was a very private man and was reportedly reserved around people whom he didn't know. Yet on stage, he was extremely assured. How could this be? Did that mean he was cocky or arrogant? No. It means he knew his destiny. He chose to live and work at his Minnesota compound. He understood what it took to fuse the two sides of his life together so he could compose and shepherd in revelatory music, shred on his guitar, master 27 instruments and vocal dexterity yet still live a quiet life. Have you figured out your formula? What does it take to ignite your best contribution to the world? Your presence is the story others make up about you, based on a combination of how they experience you and how you experience yourself. While you may never "own" a color like Prince, you can and must own your leadership presence. Cultivate these five qualities. Your presence is far too important to leave to the rumor mill.